It’s been a few years since I decided to get a tattoo. As a confirmed wuss, my initial qualms were all about the pain-factor, but as time went on and I had more adult experiences with pain, I realized that tatttoo-ing wasn’t so daunting after all. I mean, getting a tattoo (a) has a built-in time limit (it can only last so long) and (b) results in a desired effect – you get something you wanted at the end of the pain! I’ve experienced physical pain in my adult life without either benefit. The pain-factor dealt with (at least mentally), and a simple idea in mind, I set out to find a skilled artist that would be able to give me a white tattoo. This was easier said than done. Most places I looked into seemed to be reluctant to work exclusively with white ink (for lots of reasons, which I encourage you to read up on if you are considering getting one). Me, just a few minutes prior to getting my tattoo, having done oodles of research on the details . . .
Why Would I Want a White Tattoo, you might ask? First, I’m the epitome of pale. Imagine the palest person you know and then imagine one shade of outrageous pale lighter than that . . . if I didn’t have pigment in my skin or hair, I could probably pass as Albino. I’m the kind of pale where I get a sunburn just so that I can be normal-people-pale. Almost every year without fail, during midsummer, somebody will say: “Wow, you’re so pale!” when I’m actually feeling fairly tan. What does pale-ness have to do with anything? Well, Being this pale, I think that a dark tattoo would be EXTREMELY eye-catching. As a distractible person, I would probably see it out of the corner of my eye and constantly be distracted. Seriously, if I got a black tattoo on my arm (the location of choice) I’d probably wind up compulsively checking it out . . . I might even develop an awkward twitch. Second, I think they are pretty, yet subtle. I maintain that I see no point in getting a tattoo where I cannot actually see it with my own two eyes. Point of personal preference, I know, but I want to get a tattoo for myself. Quite frankly, I could care less if other people can see it because it’s something I’m doing for me. Since I consider it somewhat personal, I like that white tattoos play into a more understated style. There are other little reasons/thoughts I’ve had on the subject, but those are the two main lines of thought. Finally, a few weeks ago when I was visiting a dear friend in the greater Los Angeles area, the opportunity to get some ink from a skilled professional finally arose. After reading dozens upon dozens of reviews, I wound up booking an evening appointment with Todd Sorensen at his tattoo studio The Velvet Grip Family in West Hollywood. My own personal “superhero” of this particular league, as the owner, might be the Nick Fury of the team. Or maybe he’s Iron Man. Regardless, Todd (who goes by “The Todd” according to many internet resources) was great. Very chill, very nice, very good at artistic input, and I honestly appreciated that he encouraged me to only get a tattoo if I was 100% confident that I wanted one. He clearly knew what he was doing and my simple line of text was a piece of cake for him, but he still took his time and did a nice job. . . even when I got a little woozy from the blood-sugar plummet after a few minutes. For somebody who has been around & tattooing people as much as he has, I’m sure it would have be easy to see somebody like me and chuckle or roll your eyes, but there was none of that at all – he was great! My appointment was at 10:30 pm, which is tantamount to the middle of the night when you’re a high school teacher. 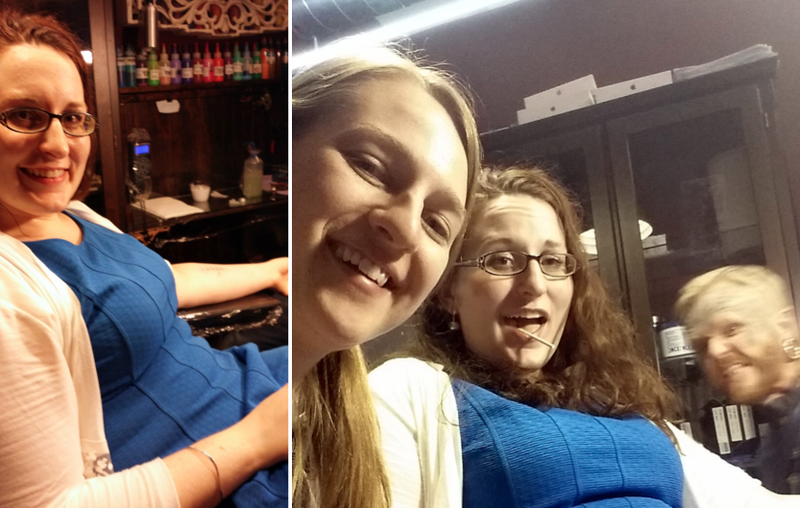 To pass the time before leaving, my dear friend Jen and I engaged in your typical, rebellious pre-tattoo activities. Then the short-lived, yet remarkably uncomfortable, inking process began. I was nervous. 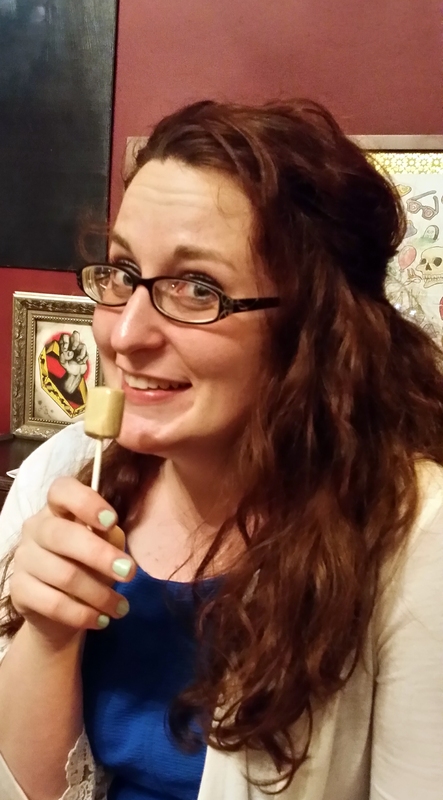 I had a lolly-pop (from See’s candies, by the way, a SCRUMPTIOUS west coast place). Jen held my hand and we talked about how, two years previously, she was in labour and giving birth to her son; a fact which rendered the whole tattoo thing quite minor by pain-comparison. Todd photo-bombed one of our goofy “Abby’s nervous” pictures, rendering it even goofier, and far awesome-er. In retrospect, I should’ve gotten a real picture with Todd, even if only for posterity, but both Jen and I forgot. Barely an hour later, Jen and I headed back home to bed, and I was the proud owner of the quite-irritated forearm bearing my very first tattoo. 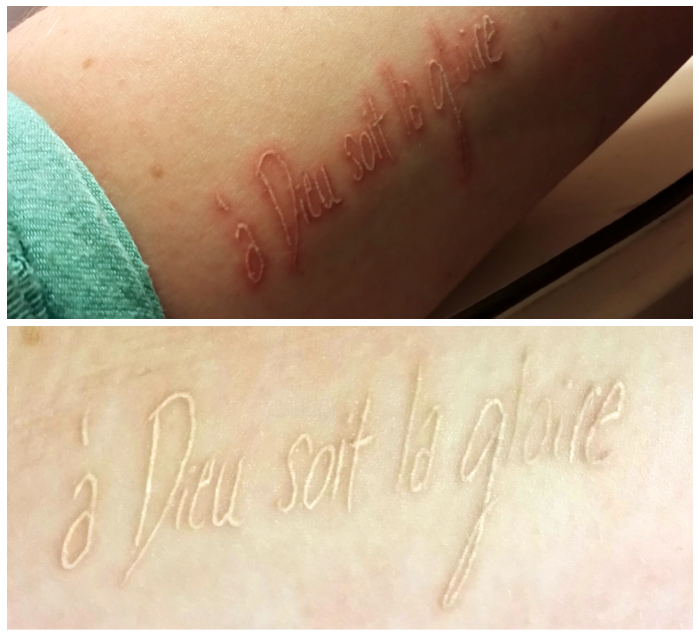 It took about a week before it looked fully normal/not-red, but it didn’t really hurt after the actual-tattooing-process was finished, despite the initial angry-red hue you can see in the “before” half of the photo above. The very next morning after my tattoo adventure, I got on an airplane and flew back to Massachusetts, where I was greeted by the only people back home who I had told about my concrete CA tattoo plans. My sisters’ mini-van door slid open to pick me up from the Logan Terminal for Virgin America, and I was immediately greeted by the excited exclamation from my four-year-old niece, “We – We’re THE SAME!! !” Confused, I turned . 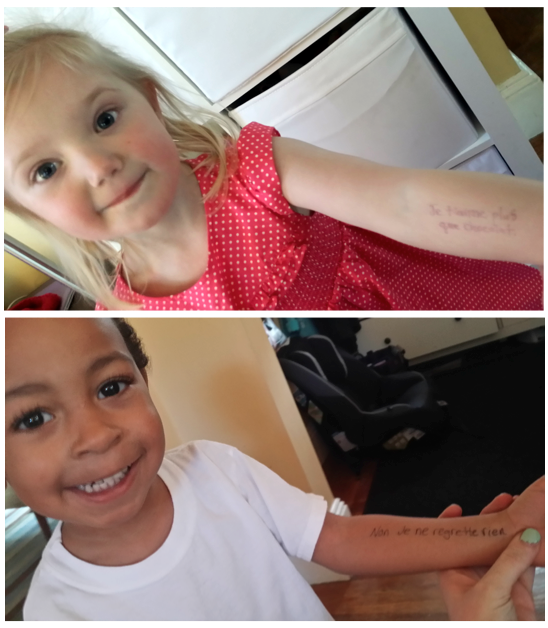 . . and discovered that my sisters had, in solidarity, “tattooed” themselves and all of the kids with a variety of French phrases on their left arms! They were so proud of their “tattoos”, and as soon as I stopped laughing, we commiserated over the shared experience of having words on our arms, which I assure you is quite novel. 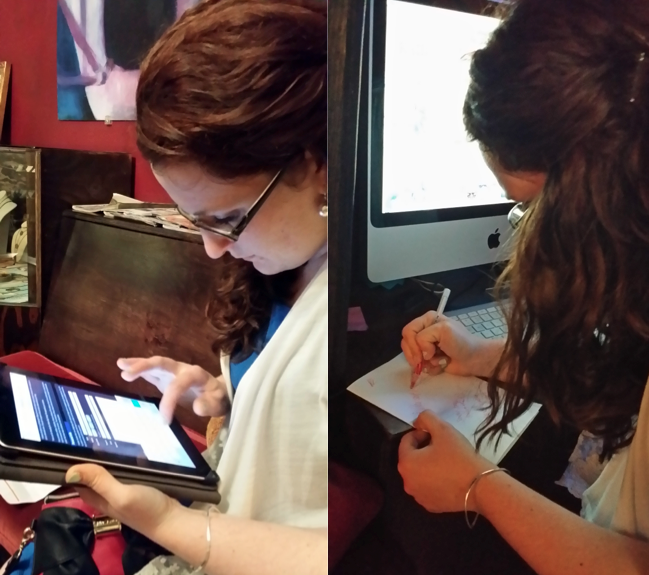 All-in-all, quite the daring adventure for this hum-drum teacher-girl! the kids’ tattoos are actually quite lovely sentiments, too!